“You can’t make a cake without breaking some eggs” well so the saying goes. The construction industry. including the damp-proofing and timber treatment section, used to have the same mentality – it was almost accepted that accidents happened and that’s part of life. Thankfully, after years of effort by the Health & Safety Executive, our industry is reducing accidents all the time. Initially it was the big boys; the Balfour Beatty’s , ISG’s and Taylor Wimpey’s who led the way. Now it’s the turn of the small companies and the Property Care Association membership are working hard to improve safety standards for the benefit of customers and everyone working in the industry. Sean Tristram-Jones CSSW and fellow PCA members being taught at PCA HQ. The CSRT (Certificated Surveyor in Remedial Treatments), has had a legal and health & Safety module for years, but this has been improved. Much of this is down to the PCA management who now have NEBOSH (National Examination Board in Occupational Safety and Health), qualification, in health & Safety at Work. The module is a must for passing the CSRT and has now been inserted into the CSSW examination (Certificated Surveyor in Structural Waterproofing), so that clients and employees can be certain that anyone holding CSRT and now CSSW must have passed the H&S module at least once. 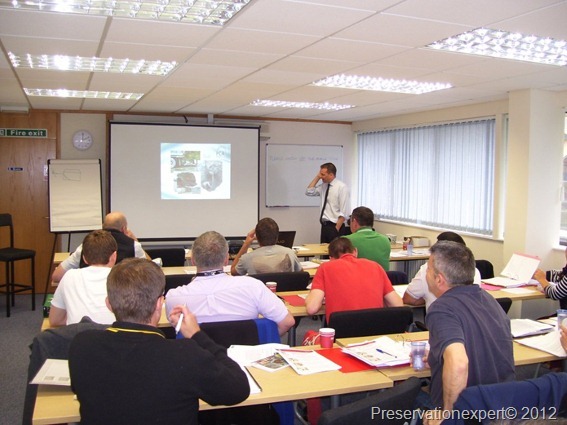 My new Business development manager Sean Tristram-Jones was at PCA HQ only last week with a class full of others attending a training day, in readiness for sitting his H&S module next month. Sean already has his CSSW (The need for the safety module was not in place when he passed that over three years ago), and having already passed his Timber and damp modules for CSRT, he needs it for his aditional qualification. Our work is fraught with danger; damp proofing, wall tie work and waterproofing means drilling, cutting, lifting heavy loads,making noise (often well above 80dB), and then there’s the dust, fumes, chemicals, alkaline mortars from lime to cements, slurries and grouts. We use some chemicals under pressure, grouts too. We work at height (the biggest risk of all), in confined spaces and may come across asbestos and other nasty’s. The PCA has moved Asbestos training up to the top too, providing awareness training at PCA regional meeting for members. Some of BT Preservation’s Technicians being taught the essentials about asbestos. That’s before the trailing cables, reversing vans and falling masonry. So whilst this blog is mainly about preservation, Health & Safety will feature now and again. I am working my way through the NEBOSH course now, as part of my goal to obtain NVQ Level 5 in occupational Health & Safety and I’ll post anything I think you could find useful as this develops. 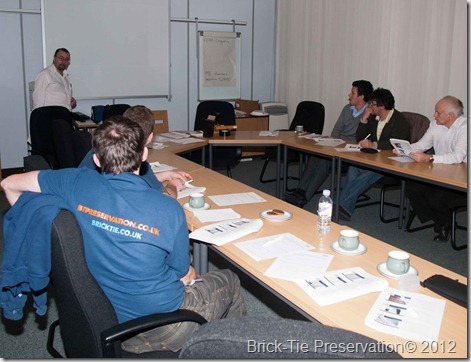 It’s true, you can’t bake a cake without breaking some eggs – but in making a cake or on any construction project there’s always the risk, that you’ll break more than intended – reducing that risk is what Health & Safety is all about and I’m committed to that goal and so are a growing band of Property Care Association members, including Brick-Tie Preservation.